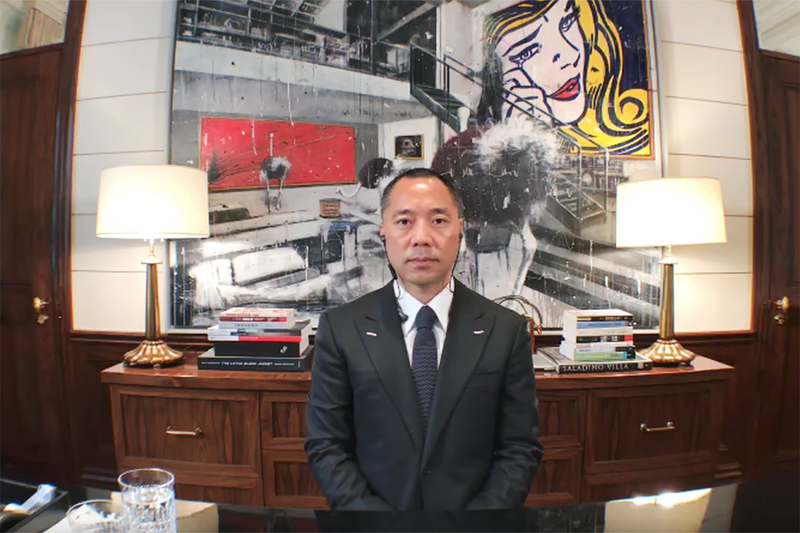 Screengrab of Guo Wengui's live stream video on May 23, 2017, on his YouTube channel. It is a big deal that Guo’s fight against Xi Jinping’s allies is taking place in the United States. We have seen from previous experience that Chinese activists can be nonchalant in manipulation of U.S. media if the goals are what might generally be considered laudatory. Fact has no standing when the purposes of public claims are solely to destroy the credibility of an enemy. Guo and his enemies all feel emboldened to freely use not only our media but our courts to float claims that can probably never be fully verified or disproved. They sense that American institutions are now —as they were not in, say, 1989—ripe for precisely this type of manipulation. They see a world in which grandiose accusations and self-pronouncements are ends in themselves. It matters only that the claims be made and amplified through the media. Journalism and the courts move slowly in the U.S. By the time evidence is adduced on one side or the other, the intended ends will already have been achieved. Our stock markets, our courts, and VOA have been buffeted by what is essentially a brawl between foreign oligarchs. We should take Guo’s claims and the lawsuits against him as an index of how deeply ailing our own institutions are. It might also be a big deal that Guo has the potential to present Xi Jinping with a test of whether his intention is to root out corruption, or to use campaigns against corruption to tighten his own grip on the C.C.P. Will he now conduct a public inquiry into Wang Qishan’s businesses —if only to exonerate him? Or, will he shield Wang from any scrutiny in order to preserve the current structure of his inquisition and discipline of the party? Or, is there another possibility? It would make sense if Wang Qishan, as perhaps the second most powerful official in China, has covert business holdings and is regularly involved in self-dealing; it is virtually impossible that this is not true. Given his role as the top corruption hunter, it is probably inevitable that accusations of corruption against him would circulate. What was not inevitable is that they would be public, strident, and so artfully presented to a global audience. Is Guo actually acting as an agent of Xi, who may for various reasons want to rid himself of Wang? Is that why Guo seems to suffer comparatively little from what could be considered heinous offenses? Will Wang and Guo both fall? But there I go with the conspiratorial thinking. I’ve caught the contagion, as must all who are exposed to it. Anything is possible until proved one way or another in court—after which, anything is still possible. What matters is that the U.S. economy and media have now become a playing field for shadow games between Guo Wengui (whose fictions begin with his birth place registration and his name) and his ostensibly very sinister enemies in the C.C.P. We built it and they came. In recent years, this kind of thing seems to happen with some regularity before Party Congresses: the heightened political tension forces some players to engage in extreme tactics, including the alleged exposure of Party secrets, or of high level abuse and corruption. There is nothing particularly unusual about the Guo Wengui incident—although that doesn't necessarily mean that it is insignificant. Guo has no credibility as a legal witness: the fact that he will almost certainly need to seek asylum in the United States creates enormous incentives to exaggerate or lie, and therefore torpedoes the legal credibility of his allegations. He could, of course, regain some of this credibility by returning to the Mainland, but that seems extraordinarily unlikely. Moreover, given the nature of his current allegations, it also seems rather unlikely that he possesses any substantial information of which the Party leadership was previously unaware. Therefore, barring significant shifts in the balance of political power, there is very little chance that his testimony will lead to formal investigations through either the Party disciplinary process or through criminal prosecution—especially when the primary target of his allegations is in charge of the former. But could this incident nonetheless shift the balance of political power? That seems highly implausible, but perhaps not entirely impossible. There is at least some possibility, if remote, that Guo's allegations become a significant source of social—and eventually political—embarrassment for Wang and Xi. Wang, in his position as China’s “corruption tsar,” could potentially lose a particularly large amount of social popularity if Guo manages to reach, and persuade, a wide domestic audience. Given that Wang needs skillful political maneuvering and significant changes to preexisting retirement norms to remain on the Politburo Standing Committee beyond next year, much could be at stake. If Guo’s main audience consists only of well-informed intellectuals who already have deeply entrenched views on the Party, then his allegations will have virtually no social impact: leftists will casually dismiss him—with some justification—as an opportunistic businessman who is lying out of self-interest, even as liberals try to be receptive. If, on the other hand, censorship and other tactics (for example, the recent actions taken against his family and business) fail to prevent the allegations from reaching a wider and perhaps more politically malleable audience, then the sociopolitical consequences could be rather significant. In fact, given the structural opacity of Chinese politics, if the allegations do somehow reach a very broad audience, they could be difficult to effectively discredit even if completely false. The key, as usual, is to preemptively prevent dissemination, rather than to persuade the public ex post. So far, there is no indication of broad social awareness, and I, for one, am not holding my breath. Guo’s credibility is scant at best as he is a confessed entrepreneur of corruption: he freely admits that he made money thanks to his unsavory dealings with senior officials and secret police arm twisting practices. Looking at his confessions from an Italian perspective, he is like a Mafioso who made his fortune through violence and sleaze and now is on the run and slings mud anywhere to try to keep his slice of luck. However, Guo’s allegations have traction in China simply because the government has little or no credibility and Guo’s statements, no matter what they are, have a ring of truth. Still, perhaps there is another more important element here. China in the past decades was the Wild West (or the wild east) reborn. Like the time when pirates helped build the English riches and robber barons made American fates. It was the time of “primitive accumulation” to use Marx’s words. But at a certain point some pirates were knighted and gave up their former lucrative habits, and some robbers became barons, all the while some others (pirates or robbers) insisted on piracy and robbing. The first, knighted and “embaronned,” became the pillars of society, the latter were simply hunted and hanged. <,p>Is it right? Maybe not, but it is history. During a revolution some are killed and some become state leaders. What took place in China in the past 20-30 years was this sort of thing, I believe. The divisions between those who became knights and barons and those who remained pirates and robbers occurred simply because at a certain historical point some realized the political air had changed and allied themselves with the new power; others didn’t and stuck to the old habits. So, the fact that Wang Qishan and his acolytes or relatives may have fortunes while Guo is a hunted man at the end of the day is the same story. Guo didn’t realize times were changing, or was stuck with the wrong end of the stick, or whatever. This is his bad luck, and history. Even if Wang Qishan and his relatives are totally innocent, as they could well be, it doesn’t matter. At the end of this process there will be people who will be rich and were allowed to be rich because of their luck or sensitivity in allying themselves with the right people at the right time. Nothing new here. What’s really at issue is that sooner or later the hunt must stop. There must be some kind of amnesty for past economic crimes that will bring the cleared private wealth into the open and establish a new normalcy that allows the surviving businessmen to go on with their business, thrive, or go bust according to the new rules. Without this amnesty to clear at least part of the accumulated private wealth and, more importantly, politically bless the new entrepreneurs, China will be stuck. In this, Guo’s denunciations prove that he simply doesn’t understand what is going on in China right now and pushes for some kind of the return to the old times when he could buy favors. This is his biggest mistake: insisting that he should be entitled to carry on being a pirate and a robber, because he so wills… Well, in history when something like that happens the protestor of old times is usually hanged.